This post is written by Kevin Shaughnessy, senior program manager and Shobhit Sahay, technical product manager for the Office 365 team. Regardless which email system or service you use, when an email message you send can’t be delivered you’ll receive a non-delivery report (NDR), also known as a bounce message. The NDR will tell you the message wasn’t delivered, but after that it’s mostly technical jargon designed more for computer science professionals than for the typical email user. You’re often left to fend for yourself to try to fix the issue, searching the web and posting questions on forums for clues to what’s going on and, more importantly, how to fix it. While advances in technology over the last 30 years have been immense, the state of the art in NDRs is still just an homage to 1982—overly technical and ill-designed for the modern email user. But that’s about to change. Over the next several months, NDRs generated by Office 365 will be enhanced to make it easier to understand and fix message delivery problems. To start, the stark and technical appearance of the “classic” NDRs will be replaced with a look that’s more approachable, more visually appealing. They’ll explain the problem and why it’s happening in everyday language, with clear instructions on how to fix the problem. They’ll include an at-a-glance view of the problem and who’s responsible for fixing it (the sending side, the receiving side, or Microsoft). And while a key objective is to make NDRs helpful to those who aren’t computer professionals, even the technically oriented bits, like the error details and message headers, get a makeover to the benefit of email admins and technical support professionals alike. To help you get the most out of these updates let’s take a closer look at the various elements of the enhanced NDRs. The first thing you’ll notice at the top of an enhanced NDR is the Office 365 logo. The logo doesn’t mean that Office 365 was responsible for the error—it just means that Office 365 generated the NDR and that either the sender or the recipient is hosted in Office 365. This can help reduce the confusion concerning which messaging endpoints or services are involved in the email transaction, information often obscured or unclear in NDRs today. Enhanced NDRs include a new Cause section that briefly states in everyday language the reason the message wasn’t delivered. It’s short and to the point—most people don’t want to know all the technical details about why their message couldn’t be sent. They just want to solve their problem quickly and get on with their lives. Your message couldn’t be delivered, here’s the problem, here’s how to solve it. In the past when you got an NDR it was difficult to assess who needed to fix the problem, and you could spend a lot of time investigating only to discover that the source of the issue was on the other end of the email transaction. But with the Fix-it Owner Indicator you can skip the uncertainty and wasted time trying to figure out whose problem it is, and get the issue to the correct person right away. The Fix-it Owner Indicator, appearing immediately after the Cause section, is an at-a-glance view of the issue and who needs to fix it. This indicator shows the three basic “actors” in an Office 365 email transaction—the sender, Office 365 and the recipient. The area marked in red is where the problem usually must be fixed, and it includes a brief snippet of what the issue is. 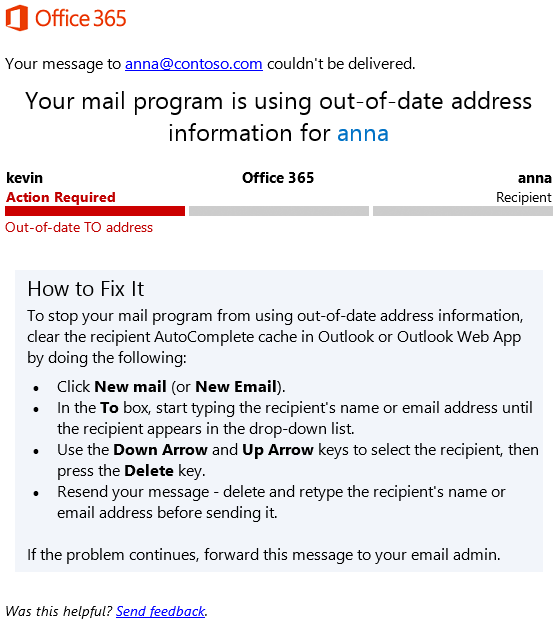 The example above indicates that it’s the sender (kevin) who needs to correct the out-of-date recipient address information. In the next example, the Fix-it Owner Indicator shows that it’s the receiving side that’s responsible for fixing the problem. While the sender still shows kevin, on the receiving side it’s now the domain name, contoso.com, that’s displayed, rather than the recipient’s alias. Why? Because in this example the email admin of contoso.com, not the recipient, will have to fix the problem at the domain level (for example, when the domain is configured to reject messages from anonymous users). If the recipient herself is likely responsible for the fix then her alias would be shown here instead of the domain name. Sometimes it’s unclear exactly who needs to fix it—the same problem could be caused by an issue on either end of the email transaction. So the indicator may not always correctly identify who’s responsible for resolving the problem in all situations, 100% of the time; but it’ll be right the majority of the time. While the Fix-it Owner Indicator is useful to quickly grasp the issue and potential resolution, the sections that follow it include detailed steps and guidance for how to fix the problem. The How to Fix It section of the enhanced NDRs is primarily designed for the end-user who receives the NDR. It uses everyday language to tell them how to fix the issue. Yet not all issues can be addressed by the person who sent the message. Sometimes someone else will have to fix it: their email admin, the owner of the distribution list they sent the message to, the recipient, the recipient’s email admin, or Microsoft Support. 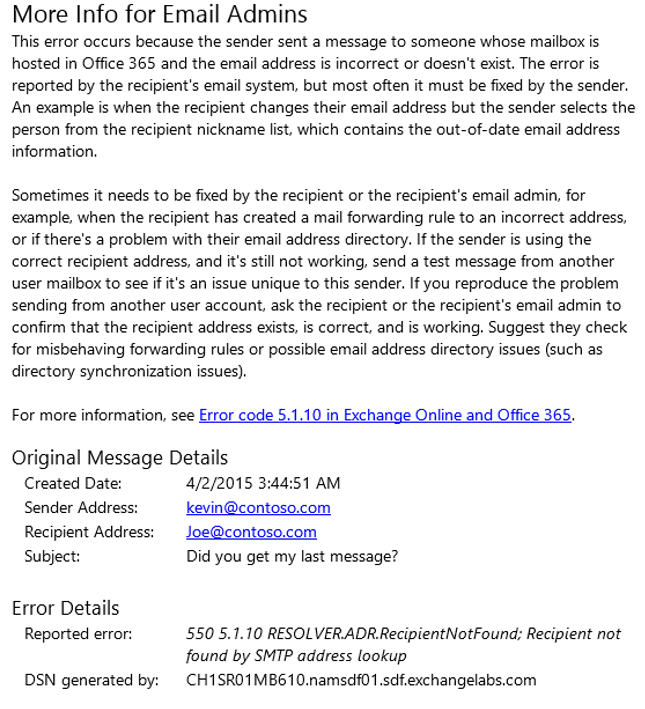 When Office 365 detects that the sender likely can’t resolve it themselves, Office 365 succinctly summarizes what needs to be fixed, and provides guidance to communicate the information to the person who can. While the top section of the NDR is mostly designed for end-users, the section that follows it is specifically for email admins and technical support. The More Info for Email Admins section provides an in-depth explanation of the problem and solution, usually includes expanded technical details, and often contains a link to a web-based article for more detailed steps and reference information. The More Info for Admins section includes easy-to-identify Original Message Details and Error Details sub-sections to make it simpler to jump right to the most important technical specifics. The information in these sections is especially useful when you’re contacting Microsoft for assistance. If you ever have to engage Microsoft Support about an NDR, provide them with the entire NDR message. But if for some reason you can’t do that, give them the information from the Original Message Details and Error Details sections—this will greatly help expedite resolution of the issue. 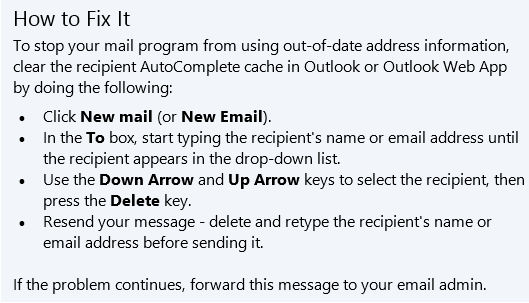 Note that while the language in this section is typically designed for the email admin of the sender, the details may be most applicable to the recipient’s email admin (not always the same as the sender’s email admin). The Fix-it Owner Indicator can be used to help determine which email admin will benefit the most from this information. And lastly, while the original message headers—in vintage mono-spaced typeface and archaically word-wrapped magnificence— still appear at the bottom of the enhanced NDRs, a neatly formatted version of them in the Message Hops section is also included. This makes it simpler to follow the message’s server to server hop path so you can more quickly spot problems between message hops. Not all NDRs generated by Office 365 will appear as enhanced NDRs right away. But over the next several months we expect that most of the ones that Office 365 generates will be recast into the enhanced format. After all, no one wants the delivery of their message to fail, but when it does, it shouldn’t take a degree in computer science to understand why and what to do to fix it. Enhanced NDRs in Office 365 will make it easier to understand and resolve many message delivery failures when they do happen, so you can get them fixed and get back to business in less time than ever before.